Nokia introduced today a mobile phone with pen input capability. The phone is optimized for messaging and designed primary for Chinese language users, but it accepts Latin characters also. 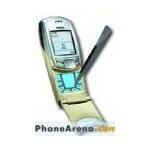 The new Nokia 6108 is a GSM World Phone (900/1800/1900), with high resolution 4096 color display, MMS, JAVA, email client, XHTML browsers, polyphonic ring tones and handsfree speaker. The phone will be commercially available in Q3 of 2003.